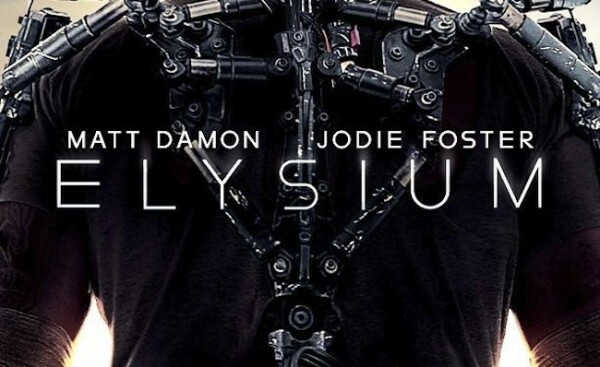 Yesterday saw the trailer release for District 9 director Neill Blomkamp’s new feature film Elysium. I want to like this movie, honestly, I really do. I want to tell you that Blomkamp’s bringing it for all it’s worth in this trailer. And I want to hold on to the hope that a derivative trailer which evokes all the nuance of Total Recall (2012) is the result of broadly targeted marketing and not a reflection on the film at large. Because the reality is, I’m getting a bit tired of class warfare for the sake of class warfare in Hollywood productions. It’s not that I have a problem with exploring economic disparity through film. It’s just that action movies may not be the best way to do it. District 9 got the job done through a pseudo-documentary approach to storytelling. Elysium, at least in its current state, looks more like In Time than it does District 9. So right off the bat the trailer manages to evoke more suspicion than wonder. Dear Hollywood, please stop using the Inception bwangh. Will somebody do me the kindness of explaining the current fixation with that sound effect? Anyway welcome to Elysium, a space station named after the fabled paradise of Greek mythology. Landscapes and wide shots set a scene which looks nothing short of gorgeous. Clean lines, tropical plants, and safe looking white people populate a land made for the privileged. Much like the mythical afterlife, there’s no disease on Elysium. The only close shots within this first part of the trailer show a sunbather crawling into a coffin-like machine, adorned with a bronze representation of Panacea (I guess), the Greek goddess of universal remedies. In Stargate fashion, the coffin cures the sunbather of pre-cancerous cells, leaving her “100% clear”. Flash a few title cards and then cut to a wide flyby of a ruined cityscape to reveal that everybody who isn’t living on Elysium is living in squalor on Earth. And this is where I call shenanigans on the trailer. Even if I muster up all the suspension of disbelief necessary to imagine a future where sometime between tomorrow and the middle of the 22nd century Humanity will be capable of building an orbital colony which looks as breathtaking as the interior of the Mass Effect’s Citadel, I don’t see how it could happen in such a way as to leave the Earth a ruin. Sure, it’s a great way of physically elevating the haves over the have-nots, but the hard sci-fi geek in me isn’t inclined to buy into the wholesale decadence. Superstructures demand cooperation and long term maintenance. And if there is some sort of cornucopia technology or next-generation energy source powering Elysium, what’s the point of hording it for the rich other than to tap into contemporary social tensions? Moving on, we witness some of the story’s central drivers coming together. 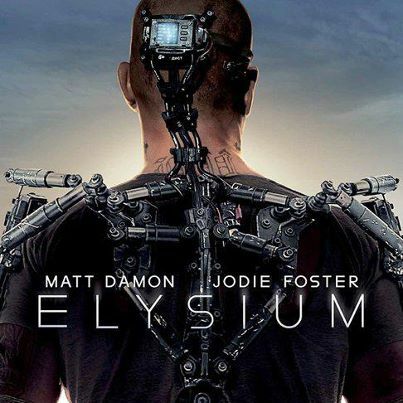 First and foremost Matt Damon gets augmented with some sort of exo-skeleton. Cool, I guess. Is it wrong of me to say the armour looks a little underwhelming? Alex Murphy totally wore it better. From there, a voice over hints at “having the power to override their whole system.” Perhaps this is in reference to the exosuit, perhaps a McGuffin kept safely off screen. Ultimately this sequence provides us with the story’s core conflict: Matt Damon wants to break into Elysium. Please let this be some sort of play on Orpheus leaving the underworld. 1:23 to 2:16…or as I like to call it, the part with smash cuts, fades, and intercuts. The rest of the trailer shapes up in typical sci-fi action movie form. There are robots, exploding cars, hover cars, and flying things that look like the drop ship from Aliens, none of which tell us anything about the movie. Jodie Foster stares seriously into the camera on multiple occasions while robots steal children and a Hugh Jackman looking ruffian pulls a sword out of his exosuit. Matt Damon slow-mo fires an AK-47 decked out to look like a future gun just because it looks cool, only after ripping the head off a robot. And toward the trailer’s end, the smash cuts sync up to persistent percussion sounds. Verdict: There may be something to Elysium as an action movie. The deceptive nature of trailers means there may also be something to this movie as a piece of social commentary, but probably not. If the story puts a premium on the idea of a man becoming more than a man, and in doing so giving up part of his humanity, to fight against an oppressive system, then it might be on to something. If the exosuit is just a gimmick to enable impossible acts of strength and agility, then this movie is going to fall flat for anybody looking for a spiritual successor to District 9. The ruffian is the same guy who played Wikus in District 9. While I agree with everything you’re saying, I’m still excited to see this movie. I like Blomkamp’s visual style, and District 9 remains one of my favorite movies. The look of Elysium as a space colony really makes me wish Blomkamp had his chance to make a Halo movie. I think he could have done very cool things with Halo as a venue and a narrative.